Then, there was the audacious left-handed throw while Von Miller was bearing down on him during the go-ahead drive, which Kareem Hunt capped with a touchdown run in the final minutes to give the Chiefs a dramatic 27-23 victory. Sure, his wide receiver made a great play. But Mahomes had made a spectacular one. It was the first time he’d truly faced adversity — the Chiefs had jumped out to early leads in each of their first three games, giving Mahomes a certain level of comfort. And while he rallied them to victory in his Week 17 start in Denver a year ago, there was nothing on the line that day. This was different in several ways. The Chiefs’ dynamic offense had been held in check all night, and wide receiver Sammy Watkins had gone down with a hamstring injury, depriving Mahomes of one of his top options. 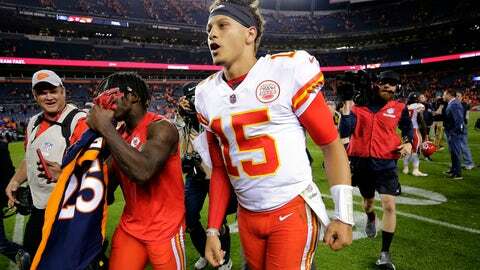 Throw in the tough road environment and the fact that the Broncos could have forged a tie atop the AFC West with a victory, and that’s some heady stuff for Mahomes to deal with. But it was Mahomes who was getting most of the credit Tuesday for his late-game heroics. Mahomes’ ability to extend plays while constantly looking downfield may have been the biggest reason the Chiefs managed to rally late. In fact, the length of time he made Denver’s defensive backs work in coverage left cornerback Chris Harris Jr. downright exhausted. Well, the Jaguars’ stingy defense gets that treat next when it visits Arrowhead Stadium on Sunday. Already, the Chiefs could be facing some adversity when they play just their second home game this season. Kelce got banged up against Denver, and Watkins and pass rusher Dee Ford (groin) did not return to the game after leaving with injuries. All three of them have been crucial to the Chiefs’ early season success. Notes: Reid said during a conference call Tuesday he’s confident in Demarcus Robinson filling in should Watkins be unavailable this week. Robinson had two catches for 31 yards against Denver. “D-Rob had a couple nice catches and actually had a chance for another, a touchdown,” Reid said.